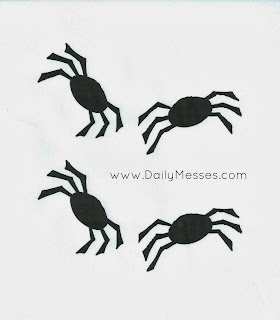 These make a cute, but super easy Halloween craft. 1. Pour some glue into the bowl and set off to the side. 2. Cut off desired length of string. This will make the web. 3. Dip string/thread into glue and run between your fingers to get off the excess. 4. Place string around the piece of paper to create the web. 7. Once the glue has dried, cover front and back with contact paper to make a placemat for lunch! Try to squeeze out extra air bubbles and trim off any excess.